Jair Marrufo referees the opening game of Week 6, when Philadelphia Union host Orlando City on Friday evening. 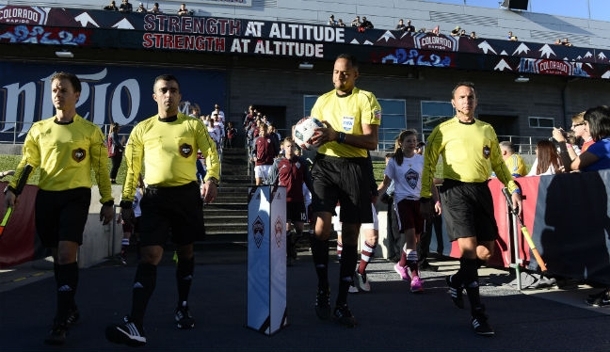 Supporting the 2015 MLS Cup referee at Talen Energy Stadium will be ARs Peter Balciunas and Daniel Belleau, while Rubiel Vazquez is handed fourth official duties – one of two Week 6 assignments for the 26-year-old. There are six games taking place on Saturday, one of which features Jose Da Silva on AR duty for the first time since joining the PRO roster. Da Silva debuted in MLS last season, and the 23-year-old will be supporting Jorge Gonzalez in D.C. United versus Vancouver Whitecaps. Jeff Muschik takes the flag opposite for that game. Chris Penso and Edvin Jurisevic with handle Saturday’s early games (4pm ET) at Montreal Impact and New England Revolution, while the remaining three see Fotis Bazakos, MLS Referee of the Year Alan Kelly, and Drew Fischer take the whistle. The aforementioned Vazquez is part of Bazakos’ crew for New York Red Bulls versus Sporting Kansas City – a club who featured in Paul Rejer’s latest Play of the Week. One of the referees mentioned in that article was Mark Geiger, and he is on duty this Sunday when New York City take on Chicago Fire. The reigning MLS AR of the Year Corey Parker will work alongside him, as will fellow AR Matthew Nelson and fourth official Mark Kadlecik. Either side of that match is Houston Dynamo against Seattle Sounders, and Los Angeles Galaxy versus MLS Cup champions Portland Timbers. Ismail Elfath takes charge in Texas, while Allen Chapman is in California with an experienced crew consisting of ARs Frank Anderson and Michael Kampmeinert, with 2010 MLS Referee of the Year Kevin Stott on fourth.